AT THE OPEN CITY LONDON DOCUMENTARY FILM FESTIVAL 16 � 19 June 2011, UCL, Torrington Place � Bloomsbury, London WC1E 7HB ALL TICKETS �5 - NOW ON SALE Open City London Documentary Film Festival brings a total of 140 films � seven of which Romanian and one Moldovan � plus a host of connected events. The ten acclaimed jurors are headed by Cannes winner Cristi Puiu, and they will hand five prizes to the films in the competition. The Festival will be shown on six different screens in the UCL compound of Torrington Place, in the heart of Bloomsbury, one of which � the open air cinema � will be powered by 20 cyclists. There will be an outside bar and caf�, live music, barbeque, and a farmers market. Four days of film and good times lay ahead of us. Full programme available on www.opencitylondon.com The Ratiu Foundation is happy to support Open City London Documentary Film Festival, showing once again its commitment to the promotion of Romanian culture in the UK. The Ratiu Foundation supports the presence in London of three young talented directors: Diana Munteanu and Ana Vlad (Romania), and Sergiu Cumatrenco (Moldova). The Ratiu Foundation / Romanian Cultural Centre and Open City invite you to a special reception celebrating Romanian film and welcoming to London the Romanian guests in the Festival. The reception takes place on Sunday 19 June 2011, from 14:00 to 15:30, in the Senior Common Room at UCL, Torrintgton Place, Bloomsbury, London WC1E 7HB. Good food, good wine, great company! Come and meet the film-makers in an open and informal atmosphere. RSVP at bookings@romanianculturalcentre.org.uk by Friday 17 June 2011. The reception is supported by the ROMANi-ONLiNE.co.uk community portal, and the online food-store Albinuta.co.uk. � Bee Moldovan � UK Premiere Documentary, Moldova-France, 2010, 57 mins. Dir. Sergiu Cumatrenco & Valeriu Sova 20:00, 16 June, Screen 2 A hive of bees from Moldova crosses the border each day, like the characters of this movie, who have gone to Paris to find another sort of nectar... � Metrobranding, a Love Story Between Men and Objects � UK Premiere Documentary, Romania, 2010, 92 mins. Dir. Ana Vlad & Adi Voicu 13:40, 17 June, Screen 4 Branding is as old as civilisation. But while in Western Europe people have long been able to choose between hundreds of brands, in communist Romania economic policy was North Korean in inspiration - one brand for each basic product. This philosophical film explores the importance these �monobrands� took on in the lives of those who made them and those who consumed them. It also explores some of the stranger goods produced under cover of these brands. Ploughshares into swords? � Victoria Documentary, Romania, 2010, 54 mins. Dir. Ana Vlad & Adi Voicu 15:50, 17 June, Screen 4 The first thing you see when you enter the city of Victoria is a stone monument shaped like the letter V. V for Victoria, V for the communist dream, which left behind, at the foot of the Fagaras mountains, an uneven cubic monument of cement, brutally stuck in a dream landscape. Under communism everyone had a job at the chemical plant, �Chemistry�. But that is now closed and Victoria feels like a ghost town. Victoria was the first city built from scratch in Romania, a surviving symbol of an era that has left behind an identity crisis with no solution. Though the product of a planner's plan, Victorians are paradoxically attached to their city, even when it seems to lack any viable identity of its own. Portrait of a rudderless society. � My Vote � UK Premiere Documentary, Romania, 2011, 42 mins. Dir. Monica Lazurean-Gorgan & Andrei Gorgan 12:10, 18 June, Screen 4 Intriguing and amusing documentary about a mayoral election, rural Romanian Style, showing how voters can be given a helping hand. The incumbent mayor announces his fifth candidacy and turns to some unconventional tactics to convince people to vote for him. A fascinating insight into a young democracy in which manipulation and deception are taken for granted. (screening with A Little Bit About Ana) � A Little bit about Ana � World Premiere Documentary, Romania, 2010, 19 mins. Dir. Diana Munteanu 12:10, 18 June, Screen 4 �I don�t even trust my mother, forget about other people. I don't trust anyone anymore.� The world of Romanian orphanages has received plenty of journalistic coverage. Diana Munteanu takes us into the world of teenagers who try to build trust with blood sisterhood but will sell their best friend to the local gangster if the price is right. (screening with My Vote) In the competition for BEST EMERGING DIRECTOR, WORLD � The Cage Short, Romania, 2010, 17 mins. Dir. Adrian Sitaru 12:10, 18 June, Screen 4 A young boy finds a injured pigeon and wants to keep it but his father refuses. 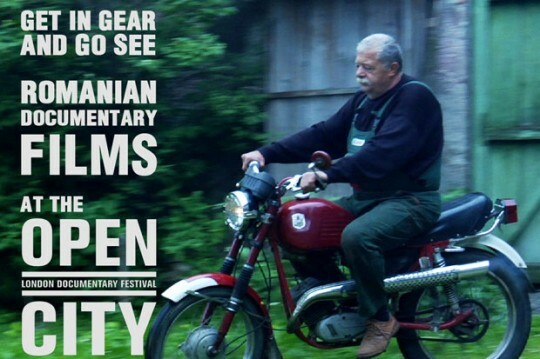 (showing with My Vote, and A Little Bit About Ana) � Close To Heaven � UK Premiere Documentary, Romania, 2010, 93 mins. Dir. Titus Faschina. Music by Balanescu Quartet 15:50, 19 June, AV Hill Dumitru Stanciu is one of the last mountain shepherds of Europe. As his forefathers have done for thousands of years, in summer as in winter he and his herd of sheep roam the far reaches of the Transylvanian Carpathian Mountains, close to the edge of heaven. He lives amidst the myths of his mountains, between bears and wolves, in the sun, wind, snow and ice - and in constant concern for his animals... Soon, he'll hang his sheepskin coat on the wall for the last time, and an irretrievable piece of Old Europe shall die. Or will his son Radu take over the herd? Beautiful film with music by the acclaimed Alexander Balanescu and the Balanescu Quartet. � Curse of the Hedgehog - CLOSING GALA SCREENING Documentary, Romania, 2004, 93 mins. Dir. Dumitru Budrala 18:10, 19 June, Darwin Theatre There are films about Roma and films about Gypsies, some big and some fat. And then there is The Curse of the Hedgehog: a year in the life of a family who refuse to pick up a hoe because they fear defilement, who burn their unsold goods before returning home so as not to lose their luck; a year in the life of Turica who appears to care more for her donkey than her husband or children - she needs the donkey to feed them - and of a family who wander from village to village bargaining a living from the stingy peasants. A great human document that transports the viewer into another way of being in the world. A great film to close the festival and remind us all of why we love documentary film. (An Astra Festival Film at Open City) Supported by the Ratiu Foundation / Romanian Cultural Centre. Also supported by ROMANi-ONLiNE.co.uk and Albinuta.co.uk Note: image above is from �Metrobranding� � Courtesy Open City.